If you’re in town for a convention or business meeting, chances are good that your free time is going to extremely limited – there are people to meet, connections to be made and parties to attend. 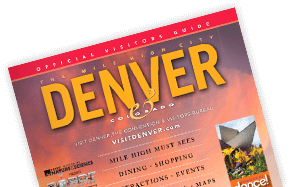 But with a little planning, you can use those precious spare hours to find out why Denver’s reputation as a truly world-class destination grows stronger with each passing year. Here’s a quick three-day itinerary to help you make the most of your Mile High stay. Your schedule no doubt requires that you be alert and awake at virtually all hours. The easy solution? Coffee. Lots of it. There are plenty of coffeehouses in the downtown area, from familiar chains to independent shops, but the one locals love best isn&apos;t a mere java joint. It&apos;s the Tattered Cover Book Store in Lower Downtown ("LoDo" to Denverites). Tattered Cover opens its doors bright and early on weekdays at 6:30 a.m., so you&apos;ll be able to get your morning caffeine fix (plus a freshly baked pastry) at the cafe, and then peruse the multileveled store&apos;s extensive selection of books, magazines, newspapers and gifts. It&apos;s a perfectly relaxing start to your perfectly busy day. Got a little time to spare, or just need a breather? Spend a little time on the I.M. Pei-designed 16th Street Mall, the 16-block pedestrian mall located in the heart of downtown. You&apos;ll find plenty of places to grab a bite, from fast food to fine dining, plus a wide array of shopping options, from big names like H&M and Banana Republic at Denver Pavilions to quaint gift stores and boutiques. There&apos;s also a wealth of classic architecture to check out, like the Daniels & Fisher Clock Tower, and dozens of public art projects scattered about. 16th Street is always buzzing with vendors, street musicians and shoppers, so it&apos;s also one of Denver&apos;s prime people watching spots. Stroll around on foot, or hop on the free shuttle that runs the length of the mall. If you&apos;re feeling ready to blow off some steam once business hours are over, Denver&apos;s got just the ticket. The Mile High City&apos;s nightlife scene is positively overflowing with martini lounges, brewpubs, live music venues, comedy clubs, dance floors and more. LoDo is perhaps the epicenter of all of this, with 28 square blocks of after hours entertainment. But you can also head to the South of Colfax Nightlife District, where you pay one admission price for four hot nightclub venues, each with more than enough drinks, dancing and DJs, all within walking distance of each other. Another early morning stop on your itinerary? Don&apos;t worry, this one&apos;s worth it -- and then some. Get some of your fellow conventioneers in a car and motor out to Red Rocks -- about a 25-minute drive -- for a sunrise hike. Aside from being a geological wonder 70 million years in the making, Red Rocks Park & Amphitheatre is one of the world&apos;s most famous concert sites and a must see for any music enthusiast. Bands ranging from the Beatles to U2 to Dave Matthews have graced the stage surrounded by dramatic 500-foot-high red sandstone cliffs. Trails surrounding the concert venue and a spectacular view of the plains make it a perfect place for moderately challenging hikes. The park is open from 5 a.m. to 11 p.m. daily, free of charge. The Visitors Center opens at 8 a.m. Enjoy some of the best and most varied shopping between Chicago and San Francisco at the Cherry Creek Shopping District. Cherry Creek offers two distinct but complementary retail and dining experiences. Cherry Creek Shopping Center boasts 160 stores, including some of the nation&apos;s most renowned lines -- Neiman Marcus, Tiffany & Co., Coach, Burberry and Macy&apos;samong them. Across the street, Cherry Creek North is home to the region&apos;s largest selection of independently owned businesses -- a neighborhood of more than 300 boutiques, spas, restaurants and galleries. It&apos;s the perfect spot to pick up that unique item commemorating your time in The Mile High City. The word is getting out: Denver&apos;s restaurant world is in the midst of a major renaissance. FromFood & Wine to Gourmet, the city&apos;s young, innovative chefs are gaining a national reputation. Always known for its exemplary steak houses, Denver now has a wide selection of Latin fusion and Asian fusion eateries, as well as virtually every other type of cuisine you can imagine. If you&apos;re looking for casual comfort food, Denver&apos;s got it. If you&apos;re looking for an adventurous eating experience, Denver&apos;s got it. If you&apos;re looking for classic fine dining -- guess what? -- Denver&apos;s got it. The downtown area is lined with restaurants, but you may also want to head out to neighborhoods like South Pearl or the Highlands for more dining options. The trim and fit residents here make Denver one of the U.S.&apos;s thinnest cities, so while you&apos;re visiting, you might feel a little added pressure to get outside and exercise - something made much easier by The Mile High City&apos;s 85 miles of paved bike trails. No matter where you are in the city, you&apos;re usually only steps away from one of these trails, which wind their way around Denver. Head over to the lovely Cherry Creek Bike Path, accessible from downtown, for a stroll or jog along the stream. Or walk over to the nearby Confluence Park, a popular spot for early rising joggers on the banks of the picturesque Platte River. Hop on the free 16th Street Shuttle and take it to its last stop. You&apos;ll find yourself across the street from beautiful Civic Center Park (101 W. 14th Ave. Pkwy. ), an urban oasis with gardens, fountains and Old West-themed statues -- and surrounded by the city&apos;s most interesting architecture, both old and new. Even if you don&apos;t have time to explore the interiors of these buildings in what&apos;s known as the Golden Triangle Creative District, the exteriors are impressive enough. Stop by the gold-leaf-domed Colorado State Capitol (200 E. Colfax Ave.) and stand at step marking exactly 5,280 feet above sea level. Then, check out the delightful Victorian home of "Unsinkable" Molly Brown, the gold rush millionaire who survived the sinking of the Titanic. Next, enjoy the whimsical and wonderful Michael Graves-designed Denver Public Library (10 W. 14th Ave. Pkwy.) -- no matter what side you look at it from, you&apos;ll find something new and inspiring. Finally, take in the adventurous grandeur of the Hamilton Building at the Denver Art Museum(100 W. 14th Ave. Pkwy.). Designed by renowned architect Daniel Libeskind, the eye-popping building evokes the Rockies with its titanium shards and crystal-like angles. No trip to The Mile High City is complete without taking in a little live music. Denver&apos;s got dozens of venues devoted to all genres and styles, from classic jazz to techno to rock and roll and beyond. Colfax Avenue is home to such beloved concert locales as the Fillmore (1510 Clarkson St.), the Ogden (935 E. Colfax Ave.) and the Bluebird (3317 E. Colfax Ave.). The cream of the local and national jazz world can be found swinging at Jazz@Jack&apos;s (500 16th St.), Dazzle Restaurant & Lounge (930 Lincoln St.) in the Golden Triangle and El Chapultepec (1962 Market St.) in LoDo. The Paramount Theatre (1621 Glenarm Pl.) also hosts amazing performances from national touring acts.